The rose Dublin Bay was bred in 1975 by Samuel McGredy IV in New Zealand where it was first introduced by its given name. 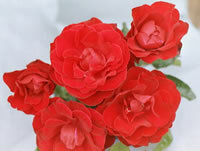 The rose was created by crossing a climbing Bantry Bay rose with a climbing Altissimo rose. The result was this stunning climber that produces fruity scented dark red blooms that average 4.5 inches or so in diameter. The Dublin Bay climbing roses are highly resistant to diseases which make them great for gardeners who don't might have trouble with other roses. Dublin Bay roses grow anywhere from 8 feet tall all the way up to 12 feet and can reach a spread of 5 feet across at full maturity. The rose Dublin Bay will thrive in zones 6 through 9, which is pretty standard for many types of roses. You will often find growers using this rose for cut flower arrangements or for growing up various supports and structures. Because of its fruity scent, Dublin Bay climbing roses are frequently planted along traffic areas where visitors can enjoy their great fragrance. You could also consider planting them near a window that you frequently keep open during the warm months to allow the smells of your garden to come indoors. 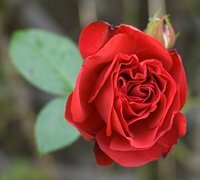 The rose Dublin Bay is a repeat bloomer which means you will get flushes of blooms all throughout the growing season if you give this rose the proper care. The most important thing you can do for it is provide it with plenty of sun light to keep providing you with all those great blooms. Dublin Bay climbing roses will not give you a great performance if you plant them in shady spots so try to provide them with at least 6 to 8 hours each day of direct sun light. Dublin Bay roses also need good air circulation and soil that drains properly. If you have a spot in mind that tends to stay damp for long periods of time, then that is not a great location for this rose. You should also try to give your rose Dublin Bay good air circulation, especially if you use a structure as a support because it can't get air through it. This isn't as complicated as it seems and many times just taking a walk through your garden is more than enough to find the ideal location for your Dublin Bay climbing roses. Planting the rose Dublin Bay is pretty easy and all you need is a shovel and perhaps a wheel barrow to make things a little easier. Before you start digging however I highly suggest that you take a trip to the local garden center and pick yourself up a bag of a nice organic compost. Once you dig the hole, put the soil into the wheel barrow if you have one and mix it with the compost at a ratio of 2 parts soil to 1 part compost. 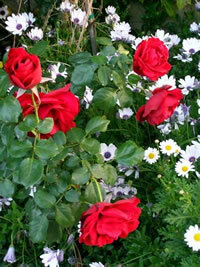 Your Dublin Bay climbing roses will love it and you won't believe how quickly they will get established. If you bought your Dublin Bay roses online then they probably arrived to you as bareroot plants. You will need to soak them overnight in lukewarm water to help bring them out of dormancy. Then dig a hole that is wide enough to handle all the roots, and deep enough so that you can mound up some soil in the center of the hole and maintain a bud union depth of about an inch or two. Then set your rose Dublin Bay into place. Next, take your new soil mix and back fill the hole around your Dublin Bay climbing roses about halfway to start with. Take a garden hose and get the loose soil nice and wet until it is almost the consistency of mud. Then go ahead and back fill the hole the rest of the way and water it heavily once more. What you are doing is making sure that the soil is covering the roots evenly around your rose Dublin Bay and that no air pockets have formed. Now if you picked up your Dublin Bay climbing roses locally, then you almost certainly got them in a container where they were already established and probably ready to start blooming. For these, just dig a hole that is at least twice the diameter of the container and equally as deep. This gives you ample room for your new soil mix and it will also keep the bud union at the same depth it was in the container. As I said before your rose Dublin Bay will need a lot of sun light, but it will also need ample water. A good rule of thumb is to give your roses one deep watering each week whether by hand or let Mother Nature do the job for you. Just make sure that you do not over-water your roses. If you can stick your finger into the soil at the base of your Dublin Bay climbing roses and it comes out damp, then don't water them yet. As for feeding your roses, most varieties will do very well with a single feeding in early spring when the leaves start to bud. Since Dublin Bay roses are repeat bloomers, you can feed them several times through the growing season to encourage additional blooms. I will often give a second feeding just as the first big bloom starts to develop, and one more in the middle of the summer to promote later flushes. Pruning Dublin Bay climbing roses is pretty easy and for the most part you are pruning for health and shape. Prune in early spring before the leaves open up as it will make it much easier to see what you are doing. You always start off by removing the dead wood along with any canes that look diseased. This is the time that I usually will rake up the dead leaves and debris from around the base of the plant as these can lead to pests and certain diseases infecting your plant. Next, begin cutting back any lateral canes from your rose Dublin Bay that overlap one another. Once the leaves open up these overlapping canes will compete with one another for sunlight. Beyond that, trim back any canes that are growing beyond where you want and train the remaining canes to whatever support you are using. 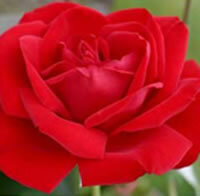 You can shape the rose to whatever general shape you desire.